Researchers have used them to measure attitudes to a multiplicity of things and it can be disturbing to find that your unconscious is less politically correct than you are. If you want to find out more about your own prejudices follow this link and have a go. I don’t know whether an Implicit Association Test has been specifically designed to measure attitudes to women artists but I would be prepared to bet quite a bit we would not do well. But it has also been demonstrated that positive experiences of any group can change scores. Indeed, the Harvard site recommend that people should seek out such experiences to rid themselves of unwanted preferences. 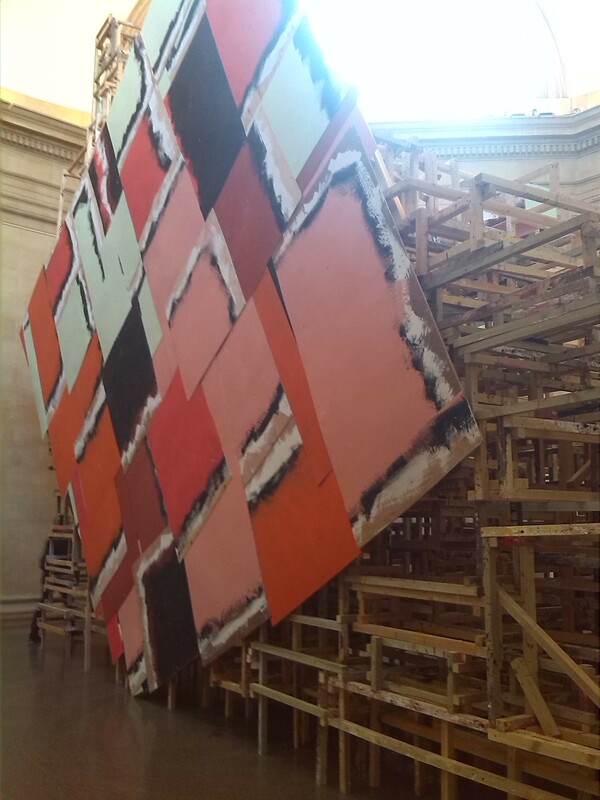 There is a possible remedy if not a complete cure any negative attitudes to women artists; all it requires is a visit to Tate Britain to see Phyllida Barlow’s Dock. BBC 2 to its great credit has been trying to remedy this viewpoint but, I believe, only partially successfully. In the recently finished three-part series, the Story of Women and Art, we saw the works of some remarkable women artists. 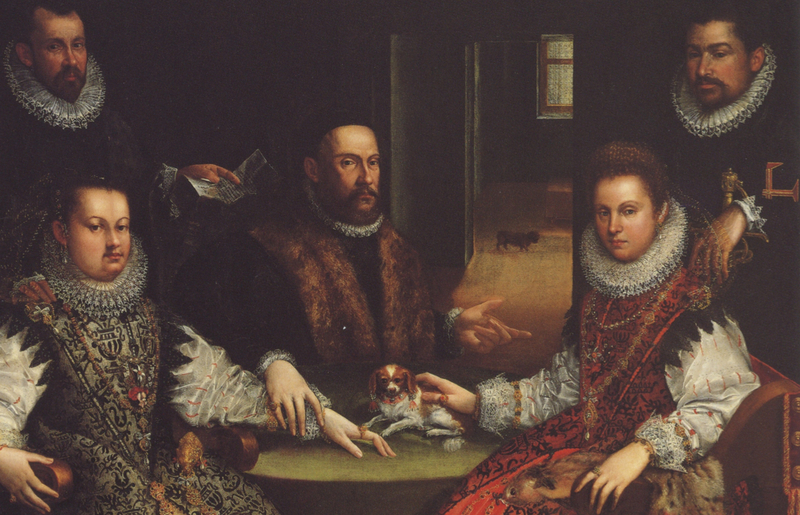 I particularly liked the family portrait by Lavinia Fontana, which shows a marvelous range of expressions, the cruel, the calculating and the wary; this apparently benign painting tells the story of a family feud and a disputed inheritance. Although the programme featured celebrated sculptors and painters including Angelica Kaufman, Vigee Lebrun and Anne Seymour Damer and showed the obstacles they had to overcome, it also included a wide range of more traditionally feminine art. Whilst it is possible to put up a tolerable case why paper cuts or textile design, painted porcelain or mother of pearl coated chinoiserie should be included in the series, they tended to be more indicative of artistic potential, or overcoming adversity, rather than measuring up to true aesthetic greatness. Some of them were actually not all that good, despite presenter Amanda Vickery’s relentless enthusiasm. They were unlikely, I reluctantly concluded, to convince the likes of Sewell or Baselitz and might even confirm them in their prejudices that women artists were more suited to water colours, fashion, craft and beautifying the domestic – “something to do with their brains,” they might say. Such views about the female brain and its suitability for this or that are, of course, bunkum. I’ve just been reading Cordelia Fine’s book Delusions of Gender; it contains a fascinating analysis of the science behind all those claims that have been put forward over the years that women’s brains are somehow different from, and inferior to, those of men. These have ranged from the highlighting of the 150 gm weight difference which Victorians believed made women less intelligent, to MRI scans which have been claimed to show that men were better at analysis and women at primary emotional reference, suggesting that women were biologically better at low paid, caring occupations such as soothing fevered brows, whilst men were better at doing the high status, well paid stuff, like maths and engineering, architecture and so on. As Fine so convincingly shows the science behind these often quoted studies has been highly flawed, showing such fundamental design failures as pitifully small samples, the absence of double blind testing and deeply subjective observations. On the MRI scans, a different group of researchers were even able to reproduce similar results with a dead salmon. Time and time again researchers have bent and doctored the data to confirm their own prejudices. What she does show, however, is the horrendous suggestibility of the human (not just the female) mind. For instance, the very act of filling in whether you are male or female before a maths test, makes women score worse as does even decor which is aggressively masculine rather than neutral. The reason for this is that the tick box or the decor can remind women that men are stereotypically better at maths. Why should this affect them adversely? One might have thought it would have made them more determined to do better, but that it turns out is the problem; if the brain is engaged in trying to combat negative thoughts, it is not giving 100% to the problem solving task in hand. So it goes on, the power of suggestion can distort the performance of men, women or indeed any social grouping. Apart from overt discouragement and discrimination, and there has been plenty of that, the drip, drip, drip of this confidence sapping barrage over the years, the lack of role models, the exclusion from training, poor networking opportunities and lack of sponsors are all ample reasons why women have until recently failed to reach the top the artistic dung heap. But perhaps things are finally changing; more women are finding their voice. Dock is a beacon. It is perhaps the most exciting work in London for years and the proof of what women can achieve given the chance. Best of all, it needs no special pleading of the kind shown in the BBC2 series. The scale of the thing is enormous. It is strong, it is bold. Inspired by Tate Britain’s position near the Thames it fills the Duveen Galleries with material in complete contrast to the classical lines but, oddly, it still complements the surroundings. If it had been constructed by a man, it might have been called masculine but it has not; it is by a women and it proves that women can be every bit as daring. Look out at the exhibits in the nearby galleries and it makes everything else look rather tame. 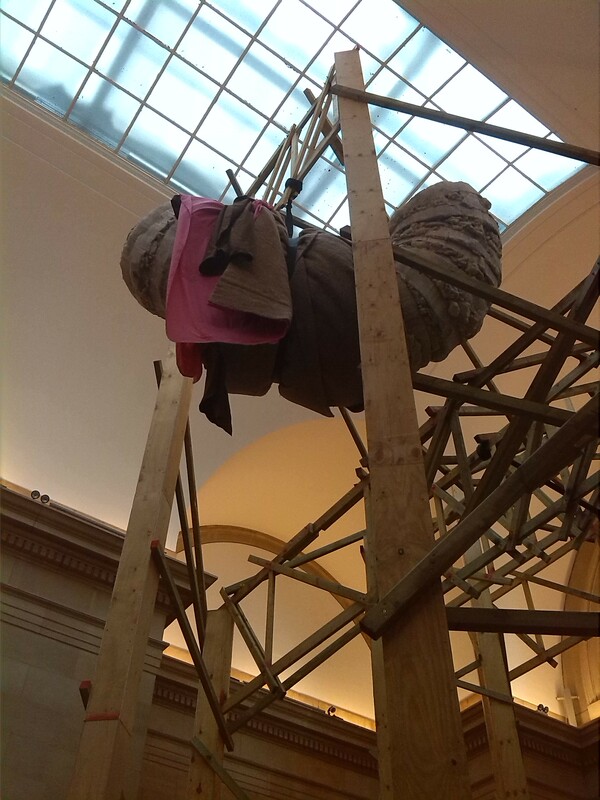 I have always loved the way that Barlow uses non-traditional art materials and in Dock you find canvas, polystyrene, cardboard, crates, rope, timber, rags, foam and paint. Enter the gallery and you are faced with what looks like a suspended shipping container, frozen at the point of being loaded or unloaded. Walk round and you can see into the interior; there are jagged edges. The inside is as interesting as the outside. You look up at things that are suspended precariously. Is that huge canvas bundle cargo? Or is it something alive? You look through difference parts of the construction and get different vistas. There is fabric there and plastic. It is almost as though Barlow has taken the contents of all the recycling centres of London to grow this vast anarchic piece. Yet there is a rhythm to the work and it all fits together; precarious yes, but also balanced. It is a work of opposites; in part playful in part aggressive. It is made of discarded bits and pieces but there is such grandeur. The sheer confidence and exuberance of the work is breathtaking; mainly sculpture of a kind, there is a large-scale painting there; a huge abstract tipped on its side; there are also amazing bits of detail. 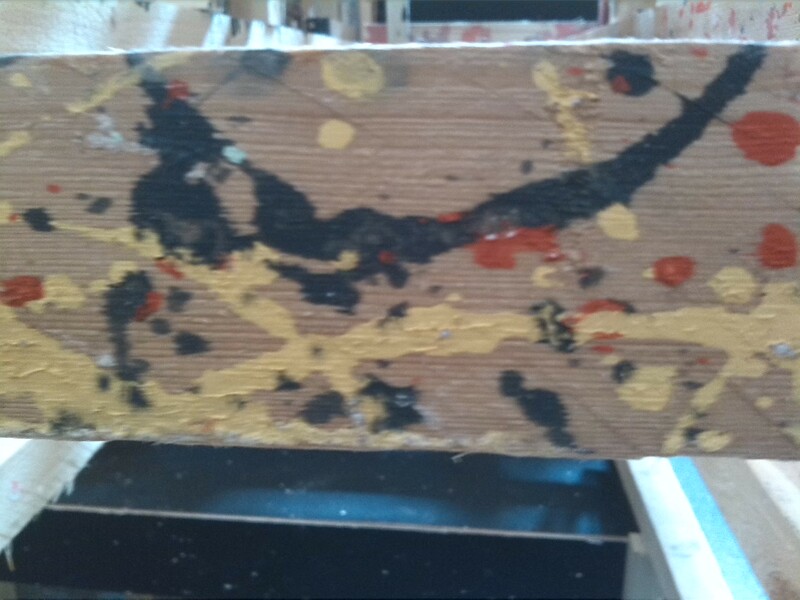 Pallets are built up in a construction which reminded me of the scaffolding involved in ship construction, but look at them closely, they are smeared with paint and each one can appear like an abstract painting in miniature, leaving me speculating about how they came to be there and how much was accident, how much design. 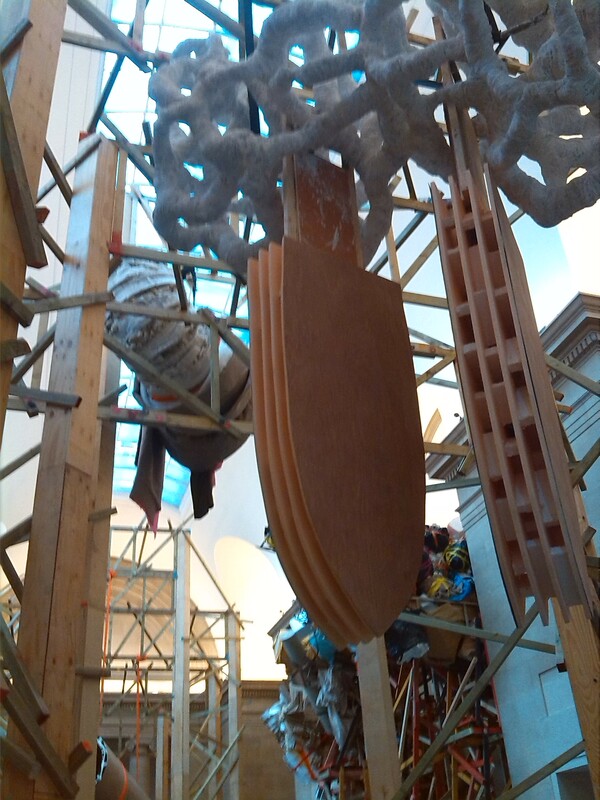 In fact that applies to the whole thing; how do you start working out an installation of this kind of complexity? But then Barlow has the experience under her belt. She has taught for more than 40 years, most recently at the Slade School of Art and had generations of students pass through her hands. Finally at the age of 70, when many are enjoying retirement, she is showing this extraordinary energy, finally getting the recognition she deserves and giving women art students of all ages everywhere, not just at the Slade, a most inspiring role model. I recently developed a mobile IAT app. It might be an insightful project to test the hidden bias/attitude toward female artist vs. male artists. Interesting article, thanks.